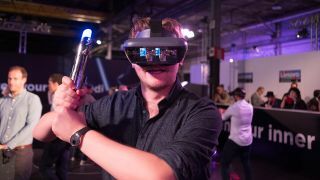 AR and VR dominate today's news stories, courtesy of our friends at TechRadar, but as well as lightsabers in augmented reality and a new virtual reality headset, we've also got details of a new Bluetooth-enabled Chromecast, and the long-awaited Galaxy X foldable phone. For years, rumours have swirled around a foldable Samsung phone called the Galaxy X, and it seems as though 2019 might be the year when we finally get to lay eyes on it. According to reports from Asia, the phone has now moved closer to production, with a new codename and a settled form factor – three connected screens, so you can fold it like a book, open it up like a tablet, and still get at your apps and data when the device is closed. It's a budding Jedi's dream come true: the ability to battle other people in augmented reality lightsaber fights. Thanks to a new update to the Star Wars: Jedi Challenges AR game that came out last year, you can now test your lightsaber-wielding prowess against human challengers. You're going to need a Lenovo Mirage AR headset, a lightsaber hilt, a tracking beacon and the game itself to get involved, but the update itself is free to existing users. From augmented reality to virtual reality, and the $399 (about £295) Lenovo Mirage Solo is the latest in a growing number of VR headsets that come fitted with mobile components, so you can leave your smartphone in your pocket while you enjoy some immersive VR. It's the first standalone headset to run on Google's Daydream VR platform, and it lets you walk around a virtual world without the need for external sensors fixed to your walls or desk. According to a Federal Communications Commission (FCC) filing, Google is planning to launch an updated version of its second-generation Chromecast with Bluetooth support. That could add the ability to connect up Bluetooth speakers, headphones or controllers, or even the option to stream audio over Bluetooth. Google hasn't said anything officially about the new device, but it doesn't look like existing Chromecasts will get the update. And finally from the world of virtual reality, Facebook has been teasing some of the tech in development for its next Oculus VR headset. Wider lenses are on the way that expand the field of view inside the headset to 140 degrees, significantly better than the 110 degrees of today's hardware (180 degrees would let you see everything in front of you). The lenses are fitted inside a new VR headset prototype called Half Dome, but there's no release date yet.